With the prestigious CIDESCO qualification for Beauty and Aesthetics under her belt and over 10 years’ experience in the beauty industry, entrepreneur and make-up artist, Brenda Botha is the innovative force behind the exclusive beauty powerhouse; Make-Up Designory (MUD) Cosmetics in South Africa. 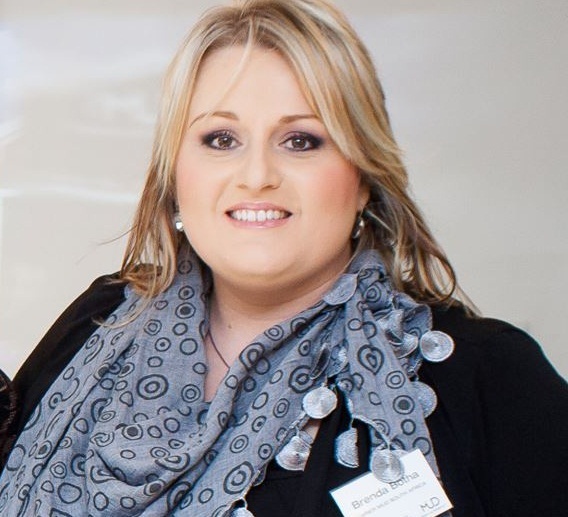 Raised in the small Karoo town, Middleburg, Brenda matriculated in Bloemfontein and went on to study Somatology and practice as a beauty therapist for one of South Africa’s award-winning skincare brands, Placecol Cosmetics. Brenda specialised in facials, pedicures and make-up treatments and later climbed the corporate ladder to qualify as an Area Manager, and later, Business Developer for Dream Nails and Body. After a while learning the ropes, Brenda left the company in 2009 and spent the next two years as Sales and Operations Manager for a local make-up brand. It was during this time where her true passion for make-up was ignited and Brenda dreamt of starting her own business as a make-up artist, which is exactly what she did! In 2011, Brenda took the plunge and started an exciting career as a freelance make-up artist where she gained invaluable experience doing bridal make-up, as well as make-up for television, print media and fashion shows. Around the same time, Brenda was introduced to US-based professional make-up brand, MUD Cosmetics and she instantly fell in love with the company’s core values and ethos. She soon realised that it was high time to expand her business and she made the decision to introduce this premium and professional make-up brand to the South African market. Even with limited funds, Brenda continued to follow her calling and MUD was launched in the local market in 2012. Since then, the prestigious make-up brand has demonstrated constant growth year on year. Currently, MUD is set to grow to new heights with a new franchise model that was introduced earlier this year, and by September, MUD will be eight franchises strong, with three of them being MUD-Certified Schools. MUD Cosmetics believes that the true purpose of make-up is to correct, cover and conceal. This honest make-up brand has a fabulous line-up of top-quality products for professionals and the public including a range of make-up essentials for the face, eyes and lips, as well as a ground-breaking skincare line to suit a range of needs. MUD is also a privately-owned business, both internationally and here in SA. And, as a result – it’s comprised of a close-knit family, all with the same love and passion for the brand. “In a world largely dominated by giant corporations, and at a time of great economic uncertainty, it’s nice to know that there are still smaller, independent companies who put the needs of their customers, partners and employees first! And this is why I will always be a MUD girl,” says Brenda. "I did the make-up course with Brenda Botha in December 2012 and I absolutely loved it!! I have been a make-up artist for 4 years and felt that I needed a refresher course. The course met all of my expectations and taught me so much more about make-up and techniques. Brenda's way of teaching is easy to understand and the practical sessions are hands-on. She never left me for a second during the practical's which is very helpful in the learning process. After the course I felt more confident in my new techniques and the brides that I did make-up for were very pleased with the product. MUD make-up itself is awesome to work with, it makes a young bride and a more mature lady look incredible and it is a dream to work with. I am extremely happy with the experience, service and products of MUD and I am looking forward to a lifelong partnership together. Thank you Brenda." "It was an amazing night, met so many beautiful people, a special thanks to the following people if without, the night would have not been possible: Brenda Botha for my Flawless make up - by MUD pro." "Hi da! Baie dankie weereens vir alles gister!! Jys rerig amazing in wat jy doen! Ek kon nie genoeg komplimente kry gister oor my make up nie!! Sodra ek my fotos kry vanaf fotograaf email ek vir jou fotos van ons almal!!" "Brenda offered exceptional training with unsurpassed knowledge. The MUD range is fantastic!"